Pick-up is available at the following hotels: Oficina Turisur (Mitre 219), Alma del Lago, Design, Edelweiss, El Casco, Inacayal, Kenton, La Cascada Charming, Llao Llao, Montana, Nahuel Huapi, Panamericano, Tres Reyes, Villa Huinid. 08:15 am - Departure from meeting point and pick-up from hotels. 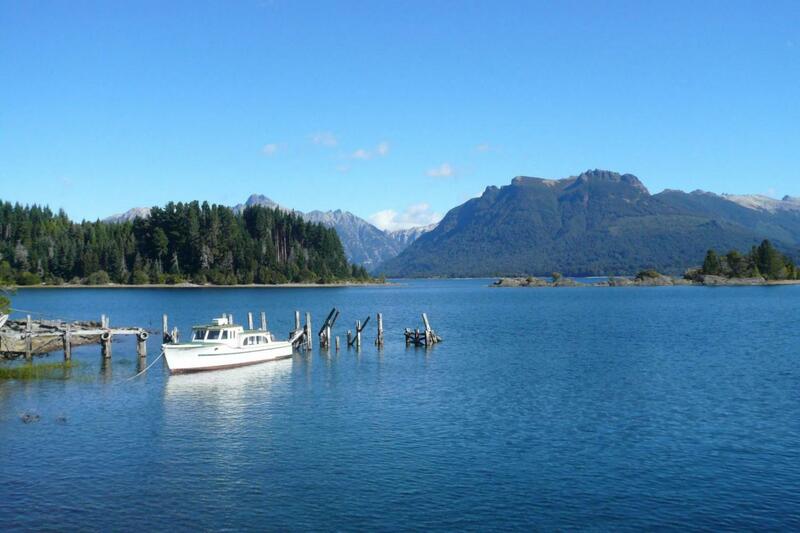 Continuation by bus to Puerto Pañuelo along Lake Nahuel Huapi. During the journey you can marvel at the beautiful swiss-style architecture that characterizes all buildings in the area, with beautiful gardens and flowers that color the place to Pañuelo Port, where we board the catamaran "Victoria Andina "or "Victoria del Lago" for sailing on Lake Nahuel Huapi for an hour to Puerto Blest. 10:00 am - We sail to Puerto Blest for 15 miles, where you can appreciate the grandeur of the landscape and the green of the forests that surround us, including the the birds and also you will learn more about the history of this place. 11:10 am - Arrival at Puerto Blest. Here you will take a bus which borders the Frias River for three miles to Puerto Alegre. Then continue on the ship "City of Faith", to sail on Lake Frías to the peaceful and pristine waters of a deep green color due to Puerto Frías. On this tour you will have a beautiful view offered by the Tronador of 3,491 meters. After a short voyage of about 20 minutes you will reach the small port of Puerto Frias, inserted in the middle of beautiful vegetation. 12:30 pm - After making the departure procedures at the customs of Argentina at Puerto Frías, continue by bus to Peulla. Appreciate the lush vegetation of the Cordillera de Los Andes, as we watch the Tronador with 9 glaciers on its summit. We then enter the Pérez Rosales National Park, where we will see Peulla. After entry formalities carried out in Chile Peulla, you will have time for lunch (the cost of which is not included). 4:00 pm - Departure to Petrohue, Peulla, sailing on Lake Todos los Santos. If the weather allows you will have views of Osorno Volcano and Volcano Tronador and Puntiagudo Hill. 5:30 pm - Continue to Puerto Varas. On the route, visit the Saltos del Petrohué (admission is not included); capricious shapes of volcanic rock, bathed in green waterfalls which continue bordering Lago Llanquihue, Osorno Volcano breathtaking views, and scenery from Calbuco. 7:00 pm - Arrival to Puerto Varas and transfer to the hotels. End of services.